If you want to be part of the Royal family, you’ve got to dress the part. According to Vanity Fair, that means following a strict no wedges policy, dictated entirely by the Queen’s preferences. While this fashion bylaw isn’t official, sources say that neither Meghan Markle nor Kate Middleton will wear wedges around the 92-year-old British monarch. Although neither the Duchess of Sussex, nor the Duchess of Cambridge, will face the Queen in wedges, Kate, 36, has been known to wear them on official engagements without her present. She sported them during a visit to the Oval Maidan in Mumbai, India during a Royal tour, during a Sports Aid Trust charity event, and during a visit to the Solomon Islands. Meghan, on the other hand, hasn’t been photographed in wedges since joining the Royal family in May 2018. The Royal anti-wedge rule is just one of many the Duchesses and other members of the monarchy are expected to follow. 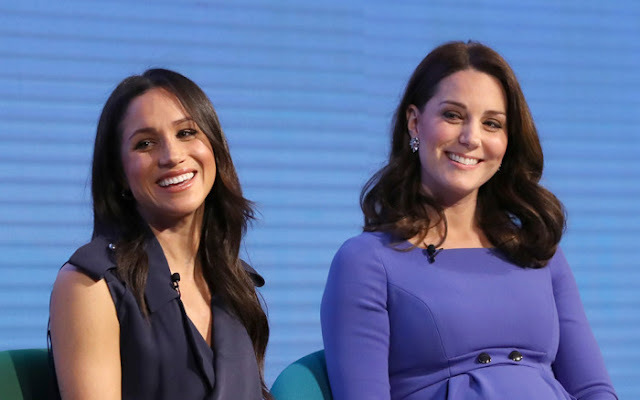 Meghan Markle recently came under fire from amateur etiquette critics for seemingly breaking two rules during an event at Buckingham Palace. rather than the ankle. She immediately caught her mistake and adjusted, slipping into the Duchess Slant posture. Myka Meier told People forgetting this posture is one of the ‘biggest etiquette mistakes a lady can make’. During the same event Meghan appeared to reach for Prince Harry’s hand, which is another major unofficial no-no, according to body language expert Robin Kermode. While it’s unofficial, much like the wedge policy, it’s something of a ‘precedent’ set by the Queen for the rest of the family. ‘The Queen rarely holds hands with her husband in public and this seems to have set an unwritten precedent for the other Royals,’ he said. Now that she’s a member of the Royal family, Meghan Markle’s had to cut garlic out of her diet, while she’s abroad at least. According to the Express, this is to avoid getting bad breath during state banquets and other events. Meghan is permitted to enjoy all the garlic she wants while dining privately.